British PM says President Trump advised her not to negotiate with EU over Brexit - but to sue. President Donald Trump advised Britain to sue to the European Union to resolve long-standing questions regarding the UK’s departure from the 28-member union, in place of negotiations. Britain voted to leave the EU in plebiscite on June 23rd, 2016, with nearly 52% of the country backing ‘Brexit’ from the EU. The vote led to then-Prime Minister David Cameron’s resignation, and the formation of a government under his successor and fellow Conservative, Theresa May. Last March, the British Parliament voted to approve the initiation of the exit procedure from the EU, culminating in the UK’s invocation of EU Article 50 of the Lisbon Treaty, which enables member states to withdraw from the EU. Once Article 50 was invoked, the UK was given twenty-four months to negotiate new terms for its relationship with the EU on issues ranging from trade to immigration and residency of foreign citizens in the UK – and British citizens in the EU. Unless the EU’s 27 remaining members vote unanimously to grant an extension, the UK’s relationship with the Union will be automatically terminated on March 29th, 2019. Since the invocation of Article 50, Prime Minister May has struggled to reach an agreement with the EU regarding Britain’s future relationship with the Union, coming under pressure from her own government. While some lawmakers have favored a “soft Brexit” – preserving much of the status quo via a comprehensive negotiated settlement with the EU – critics of the Union say they fear that a “soft Brexit” would fail to curb the Union’s control over British policy. A number of high-ranking officials in the May government have resigned recently in protest of the deadlock and potential for a “soft Brexit”, including foreign affairs minister Boris Johnson. According to Prime Minister May, President Donald Trump had advised her to steer clear of negotiations with the EU, saying that she should sue the Union. Trump landed in London on Thursday for his first state visit of the UK since he took office in January 2017. 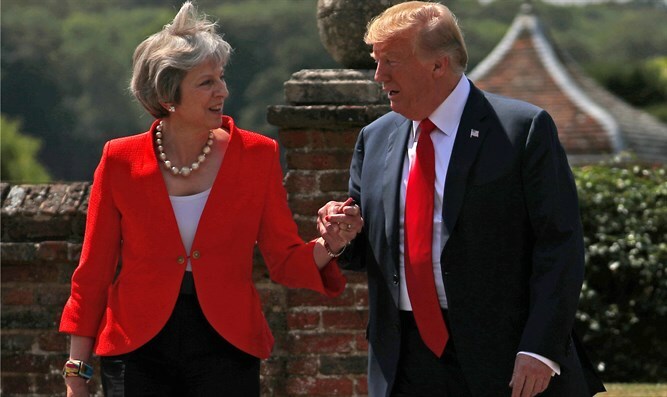 Ahead of his visit, Trump criticized May’s handling of Brexit, telling The Sun that May had likely “killed” any chance of a free-trade deal with the US, adding that May had ignored advice he had offered her regarding negotiations with the EU. “I would have done it differently. I actually told Theresa May how to do it, but she didn’t agree, she didn’t listen to me,” Trump told The Sun last week.